Banners remain an effective and affordable advertising option for businesses even as many promotions have moved to electronic media. 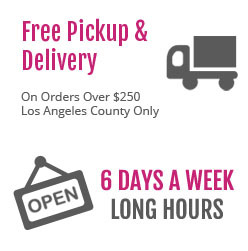 With an array of printing options and fast delivery, our Los Angeles same day banner printing services are an ideal source of banners for area companies. Banners can even be useful for non-business purposes at celebrations and other events. Banners make advertising messages highly visible and do not limit companies to displaying their promotions in fixed locations. The materials and inks used for our same day banner printing in Los Angeles can both be colored to express messages or match the trademarks of the client. Because of their low cost, banners can be ordered in volume so that promotional coverage is maximized. Affordability of banners also helps companies save money that they can use for other aspects of business. 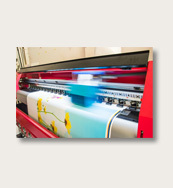 In addition to offering different banner colors, our print office supplies banners printed on a wide range of materials. This material selection makes banner advertising possible indoors or outdoors and enables mounting on numerous surfaces. For example, companies can hang magnetic banners on metal surfaces, including vehicles. When made of vinyl, banners easily withstand sunshine as well as rain. Finally, many banners from our Los Angeles same day banner printing services can be folded or rolled up for storage without causing damage, preserving the option of future use. The portability and low cost of banners makes this form of advertising ideal for short-notice promotions. Whether an event has suddenly been scheduled or a sale is being opened without delay, the right banner can be printed on the same day it is ordered so that business can proceed as planned. No matter the application planned for a banner, getting it right away can save time and money for clients. With same day banner printing in Los Angeles, clients can move to the next step of a promotion without being bogged down waiting for the advertising materials they need. Clients can call us or contact us through the form on our website to learn more about our banners and other same day printing services.